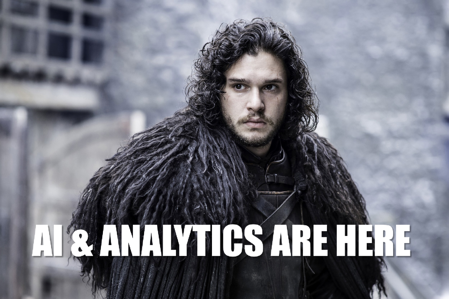 As the much-anticipated final season of Game of Thrones (GoT) approaches with the telltale sign of fans eagerly tweeting #WinterIsHere, AI and analytics also continue to encroach on our lives with the relentlessness of an army of White Walkers. While fears of AI becoming self aware and subjugating the human race remain premature, there is no denying that data analytics plays an ever-growing role in almost everything we do. The ads that pop up on your computer as you search for the latest Jon Snow conspiracies, the call you receive when someone in Kazakhstan nefariously attempts to purchase three iPhones with your credit card, and even the harsh reality that Netflix sometimes seems to understand us more than our significant others are all driven by algorithms attempting to make our lives easier. AI and analytics are here to stay, so, how do we embrace this evolution and get our teams on board? Start with a simple question: With massive amounts of data being created daily how do we keep up with it all? The reality is we, as humans, cannot review all of the information we receive. As a result, we have to look at things differently. Even the most die-hard Luddites will admit we are seeing a shift within and outside the legal industry as technology adoption increases tenfold across the world. Forward-looking companies and law firms will reap the benefits of substantial cost savings and increased efficiency that AI and data analytics can deliver. Examples of how AI and analytics are transforming the practice of law abound. In reviews involving many documents and technology-assisted review (TAR), lawyers are now able to show clients exactly how much review time was saved by comparing how many documents were reviewed by TAR vs. what would have been yielded by traditional keyword searches (hint – a lot less). Analytics based on natural language processing (NLP) are being used to create drafts of legal briefs that were previously done manually and to help people get plain English answers to basic legal questions. It’s clear that AI and analytics can provide those surrounded by mass amounts of data and documents each day with significant efficiency gains, but, what about privacy concerns? GDPR is here to stay. From a technology perspective, companies must consider how to effectively protect and anonymize data, identify PII, and comply with new privacy regulations across a growing number of jurisdictions. Technology companies, including legal service providers, are scrambling to develop solutions to protect privacy and address further needs developing in these areas. Next, let me address the elephant in the blog (so to speak), one question I hear raised (or whispered) is will AI and analytics take away legal jobs? The answer is, like in virtually all industries being impacted by analytics and other technology advances, definitely “yes.” The good news is that the legal jobs and tasks that AI will take away are probably the ones you will miss least. The even better news is that analytics and other emerging technologies will create better, more interesting jobs. I’m part of a generation of lawyers who started their legal careers with dreams of drafting Supreme Court briefs and working alongside Calista Flockhart, but instead faced the harsh reality of seemingly countless hours of basic document review. AI and analytics are already making an impact on reducing the hours attorneys spend reviewing documents in litigation and regulatory matters. Alternatively, law firms and corporations are creating new jobs focused on applying machine learning and other data analytics to improve how they practice law. Formerly practicing attorneys are starting technology startups aimed at developing better and faster ways to accomplish basic legal tasks. Three years ago I earned an analytics-focused Masters degree, just one of two lawyers in my class. Our professors were surprised to see how well AI and machine learning could be used to tackle legal tasks. After all, the purpose of analytics is not to replace humans, but to enable them to use data to make better decisions. First, have a goal. Is your objective to increase efficiency? Save review costs? Create better work product? To have something other than politics to talk about at cocktail parties? Your goal will direct which algorithm or model is best for a particular task as well as what technologies and human expertise will be required. Second, know your data. The type of data you have access to will be a major factor in harnessing the power of analytics. Trying to find a way to better assess contractual risk for clients? Well, you’ll need access to similar contracts (the more the better) in order to sufficiently train your models. Third, find the right experts. Applying analytics to legal issues takes two types of experts: lawyers and data scientists. Leveraging the respective expertise of lawyers and data scientists will be a key factor in transforming our industry. Finally, expect a lot of hard work. Data science and the practice of law are both rigorous professions. Successful analytics-based legal solutions are built on a foundation of blood, sweat, tears, and Mountain Dew. In those moments of extreme frustration, always remember, “When the snows fall and the white winds blow, the lone wolf dies, but the pack survives.” Not particularly helpful in solving thorny AI problems, but a good reminder that sometimes its okay to take a break and draw inspiration from Jon Snow. If you would like to chat about AI, analytics, or GoT, reach out to me any time at RHellewell@lighthouseglobal.com. At Lighthouse, Rob counsels the world’s top corporations and law firms in ediscovery and leveraging analytics, data science, and technology to extract critical insights from data. Rob’s expertise includes applying analytics and developing data-driven solutions to reduce risk in compliance and legal matters. Rob’s education and professional experience combine data analytics and legal expertise. He received his M.S. in Business Analytics from New York University, where his research focused on applying text mining, metadata, and sentiment analysis to detect legal risk in unstructured data sources. He received his J.D. from Brigham Young University’s J. Reuben Clark Law School. Rob previously practiced in the Antitrust and Trade Regulation group of Skadden, Arps, Slate, Meagher & Flom, where he counseled clients in connection with complex litigation and regulatory investigations from the Federal Trade Commission, Department of Justice, Securities and Exchange Commission, and other state and federal agencies.